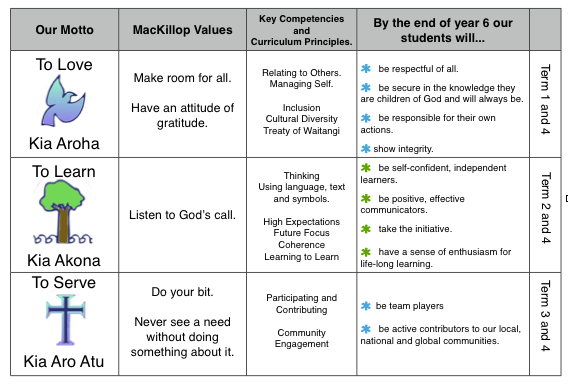 We aligned it with our MacKillop values and the Principles and Key Competencies from the New Zealand Curriculum. These are a set of values our Year 6 students will have fostered by the time they leave our school. We hope they will live these values as part of their everyday lives. These values are integrated into our curriculum and each term we focus on specific part of our logo, values and attitudes to be taught and reinforced. Children are also recognised for displaying values in the classroom and the playground. They may receive a certificate from their teachers or their names are put into the star box by the duty teachers for a lucky draw. Copyright © 2018 St Francis Xavier Catholic School. All rights Reserved.